Flammable Storage Cabinets - Enough Protection? Do flammable storage cabinets provide enough protection for flammable materials? When storing flammable hazardous material, are thin sheet steel storage cabinets really the safest solution? The answer is, it all depends on what type of flammable material is being stored. A great way to find out what type of flammable you are storing and how dangerous that flammable chemical may be, can be to check the NFPA 704 classification ratings. There is a distinct difference between a flammable storage cabinet and a flammable storage building. Flammable storage cabinets are made for storing materials with very low flammability ratings, to materials with non-flammability ratings. On the other hand, flammable storage buildings offer fire rated protection for either 2-hour fire ratings or 4-hour fire ratings, while providing extreme flammability protection and even protection from combustible materials. Flammable storage buildings offer protection for low level flammable materials (Class 1 flammables), all the way to extremely flammable materials (Class 4 flammables). Do flammable storage cabinets really provide enough protection? Flammable storage cabinets do not have the fire ratings that flammable storage buildings have. The truth is flammable storage cabinets do not provide enough protection for storing flammable materials, especially when storing flammable materials near or inside your facility. 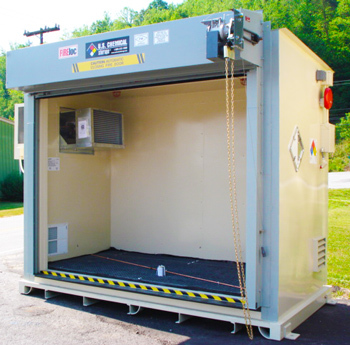 Flammable storage buildings not only have radiation, conduction and convection protection, but they are fire rated for intense flammable situations. Federal policies and state regulations have been adding up, in result of the many chemical explosions and chemical fires in the spring and summer of 2013. It is becoming more important to keep your flammable storage compliant in today’s regulation-focused environment. Not only do state and federal regulations benefit the environment, but they also benefit human health and provide for a safer work environment. When storing hazardous materials make sure you are using the correct storage method that is right for your specific chemicals. Before storing your chemicals in a flammable storage cabinet, make sure to check the NFPA 704 classification ratings. Be sure of what you are storing and remain protected.